The following article is a high level overview of the generic process approach that many FMCG companies take in front end innovation. Whilst not a one size fits all, it is however, a relatively consistent approach taken by many larger international companies. The approach is simple to manage if you are an individual starting out on a business making opportunity but how does it work in existing businesses? Well I suggest you need a process. Why do you need a process? What does a typical process look like? Before you even start making prototype innovation products it is critical to go through the first few stages of the process, this stage is often called FRONT END INNOVATION. Front end innovation involves collecting and collating information both internally and externally, carrying out carefully structured ideation sessions, creating concepts with the consumer in mind, looking for technical ways to make it work and then validating the concepts with consumers. All this happens before you start spending money resources on making a product. It’s commonly believed that innovation starts with a creative idea. But what makes something a creative idea? An idea is simply combining two known elements. A creative idea on the other hand combines existing elements for the first time. 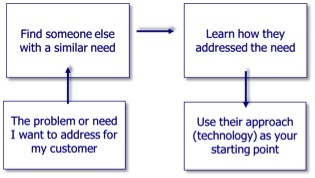 In most organizations a customer need is matched to a technology to address that need. Thus, innovation starts with information, not creative ideas! Many organisations will have a wealth of prior experience and knowledge in their existing product category built up over a number of years. Whilst in some companies this will be well recorded and accessible it is unfortunately often not the case. So one of the first activities is to bring all of this prior experience together review and summarise. It is often better for someone outside of the business to carry out this activity to give it objective impartial credibility. As well as internal knowledge there are tools available to identify and review external knowledge that may be relevant for the next stage, examples of which are product space mapping and technology trends etc. These techniques are a subject for a further discussion. It is worth at this very early stage getting some simple level of engagement with consumers. This may be as simple as company employees who use existing products, relatively unstructured focus groups and retail market trips to understand how consumers purchase product currently. Only after the above stages should the first ideation sessions be planned and carried out. Again, the techniques used for ideation sessions (of which there are many documented) are a subject for further discussion. The preparation of the sessions with all related information to hand is critical. To be able to engage with consumers you need to be able to present the idea in a credible and consumer understandable way – “The Concept”. or even better described as a “consumer relevant proposition”. COLGATE Time Control is a product focussed upon gum strengthening. The consumer need is articulated as "As I get older I notice my appearance changing and part of this is my mouth and teeth." COLGATE have therefore developed toothpaste that aims to restore the youthful appearance of the mouth while providing healthy gums and teeth. COLGATES Time Control contains a unique specially formulated gum protection system aided by Vitamin E which helps stop receding and inflamed gums. 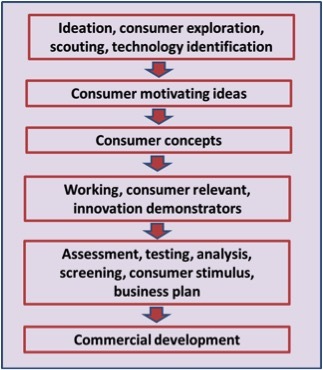 The concept describes a ‘consumer need’, a ‘reason to believe’ for the consumer and a technology that is described in consumer relevant language. The concept also provides marketers with a holistic picture of the innovation that they can relate too without a significant technical understanding. A simple process approach is good to start with. Well thought through visual material is critical for engagement with consumers. The words used must explain the concept in an unambiguous and simple way that a range of different consumers will relate to. Pictures that describe the benefit and reinforce the words of the concept are critical at this stage. Early stage focus group work can now take place with the story boards, the concept and any other relevant materials controlled and run by experienced and skilled facilitators. The author of this artice, John Sampson, has been working in Global FMCG companies for nearly thirty years before recently setting up his own consultancy company; JR Sampson Consulting. As part of a partnership with a range of different skilled consultants he specialises in the management and interpretation of front-end early stage consumer research, ideation innovation, concept development and product design. I attended a Strategy and Innovation event in London yesterday and if I’m being a little negative, these events tend to be similar with ‘real insights’ being pretty rare.